Beach Mountain 2 Condominium. This is a great budget 2 bedroom property which offers a convenient beachside location, with easy access to both Jomtien and Pattaya. This is one of the cheapest 2 bedroom rental options currently available. Beach Mountain 2 Condominium is just 800 metres from the beach, and the condo has its own communal swimming pool and fitness room, plus there are lots of parking spaces, high speed elevator, security guards and even an on-site maintenance team. A taxi route supports this location of Jomtien and Pattaya City. This means you can be in and out of the city easily if you want to head to the high street shopping malls, enjoy the nightlife, or head to one of the various beaches. 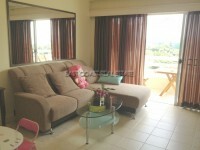 This 2 bedroom, 1 bathroom unit is located on the 5th floor of the building and offers a generous 64m2 of living area. The property is offered fully furnished, and has air conditioning in every room, a fitted Euro kitchen and a nice bathroom.